November 1, 2015 by Anna F.
Before hearing about the first MLM, I had never heard about wealth building. The only time I ever heard about wealth is when there was an article or a television segment on a famous television personality or athlete. I had no idea that there were “ordinary” folks who aren’t earning a gazillion dollars for a major motion picture, making billions every year. Did you know this? Who knew that you could build your own wealth portfolio? You don’t need to hire a consultant from some major financial corporation. You can do it yourself; you can be in control. I don’t mean any disrespect, but with the level of dishonesty in some people, in particular banking and financial institutions, you have to be real careful on who you trust with your money. For me, I would much rather trust the word of people who started created their wealth from the bottom. We would be more on one accord, and I could understand where they are coming from than someone trying to sell me a bill of goods. This is exactly what Debbie & Geoff Davis did. They are ACN independent distributors, and they are also wealth builders. If you are not sure what wealth builders are, they are entrepreneurs who use their skills, knowledge, and expertise to help others achieve financial success, time freedom, and individual growth. These folks sound a whole lot like every top-earning multi-level marketer I have written about. 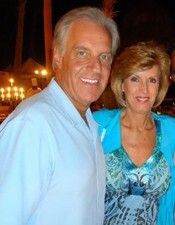 Due to their high level of mentoring and hard work, Debbie & Geoff Davis have become part of the Top 200 Worldwide Earners in MLM in 2015. Debbie has also become a Senior Vice President and a member of the Circle of Champions. They have been with ACN for 15 years, and Debbie & Geoff consider themselves to be truly blessed to be given this unique opportunity. Before joining ACN, Debbie was a stay-at-home mother of three children (Brad, Devon, and Casey). Geoff worked at one of the Big 3 auto corporations. They lived in Leonard, Michigan, and they had always dreamed of designing and building their own home. Throughout their marriage, this became their common goal. They just needed to find a way to make it happen. It turned into an 18-year process due to their biggest obstacle, which was lack of money. Although Geoff made an excellent salary with his job, it was paying the bills. It wasn’t giving the family the extra they needed to start breaking ground on their dream home. They knew they needed to look at a way to earn some extra money on the side, hence they started looking at network marketing. Debbie wanted to lend a hand in helping the couple in reaching their goal faster. Since she was taking care of the children, she needed something she could do on the side that could be very flexible for her. In 1993, Debbie was introduced to ACN, and after 15 months with the multi-level marketing business, the couple had enough money to break ground on their dream home. What an amazing accomplishment. What took them only 15 months, sometimes takes years and years for others to accomplish! Geoff said that once they started working with ACN, there was no looking back. Two weeks after moving into their new residence, Geoff quit his job at Chrysler. The couple said they are have a hard time drawing the line between friends and business partners, because they all have become like family to them. Geoff states that he loves working with his wife. Debbie has become a leader and motivator. He said that there are no motivators in corporate America (I have said this many, many times in my blogs!). Geoff readily admits that ACN was and is the catalyst that helped them achieve everything they wanted out of life. ACN wasn’t Debbie’s first try at working from home. She had tried other avenues, but she kept failing. In turn, she started losing her confidence. But when she heard about ACN, she knew this was the network marketing company was the one. She believed in the founders and the services, and she knew that she could be successful. With ACN, failure wasn’t an option. Since Debbie started with ACN at its beginning, there were no success stories to fall back on. If she wanted a success story, she was going to have to be it. This is exactly what she did; she became an ACN consultant (one of the first). Geoff & Debbie both agree that it takes courage to be start a home-based business. And it’s not just that way for them. They believe this is true for every member of their team. Geoff said something too that I would like to share. Debbie said it took her two years after joining ACN to believe that she could accomplish her goals. She had to start telling herself that she had the abilities to make great things happen for herself, her family, and her team. To her, the personal growth is more important than the financial growth. Not to say she doesn’t enjoy earning $115,000.00 a month. But she doesn’t think that a price can be put on the development of her self-assurance. She said the only boundaries and hindrances in becoming a network marketer are the ones you put on yourself. Her purpose: to do good and help other people. If not that, then what else (Debbie’s words). Even more important, Debbie said that to become successful in MLM, you have to step and think outside the box to see all the amazing possibilities. 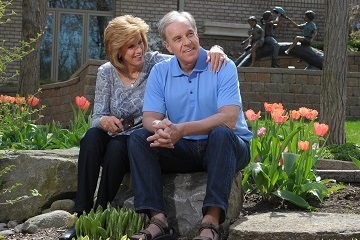 I don’t know Debbie & Geoff Davis personally, but they are truly remarkable people. It is no surprise to me at their level of success in the ACN business. Being an independent distributor for ACN has made her a better wife and mother, as well as made her a stronger individual. I know I keep saying this is an important saying from Debbie & Geoff, but I have another one. Geoff said that it really wasn’t hard leaving corporate America. The one thing that he loves is that ACN is a totally positive atmosphere. They love being around people who are goal-oriented, driven, and share the same characteristics as they do. Not to mention being able to hang out with other ACN millionaires like Art Napolitano & Simon Abboud. Debbie & Geoff not only enjoy financial and time freedom, but they also were able to be parents to their three children. I didn’t know this, but these two individuals are the only people in ACN history who have been Circle of Champion members for 20 consecutive years. How great is that! I truly admire the ambition of the Davises. I know, I know, I keep saying that Geoff & Debbie said this and that, but they are two of the most intelligent people, in or out of MLM, that I have ever encountered. With that being said, I have another saying from the two that I would like to share with you. They stated that ACN has given them everything money can buy, and everything money can’t buy. I have really gotten plenty of wisdom from these two people. If you are thinking about starting your own home-based business, you can learn a thing or two from Debbie & Geoff Davis. Heck, you can learn a lot about how to succeed in life in general from these two. 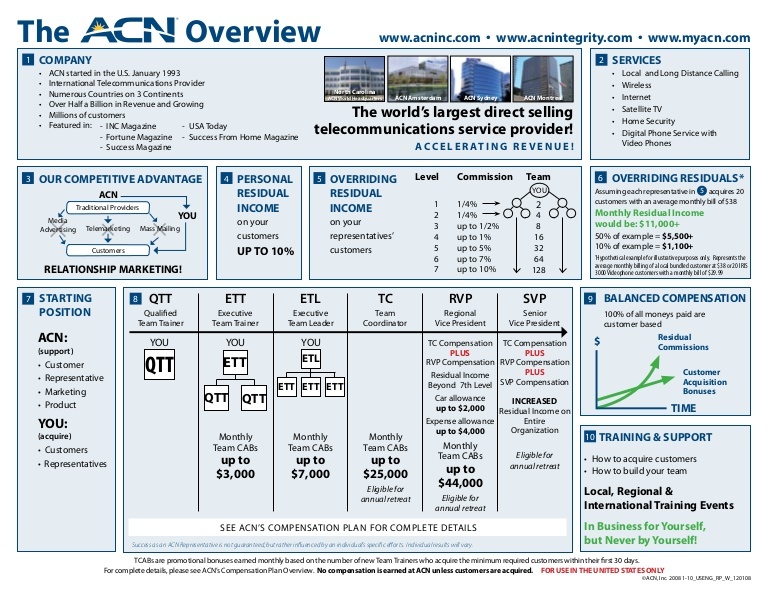 ACN multilevel marketing business was founded in 1993 and focuses on offering energy, telecommunications, and banking services. Through independent disributors, like Debbie & Geoff Davis, customers can sign up for services with some of the world’s leading provider. Meaning, ACN agents sell the services, but order fulfillment, billing, and installation is done by the provider (AT&T, Verizon, Comcast, etc.). Although the company is based in North Carolina, it has expanded tremendously over the years into countries, such as Amsterdam, Austrailia, Sweden, and South Korea. I have said this before, but the reason I believe that this company is so successful is because of the services it offers. In today’s society, you can’t find one person, young or old, who is not into some form of telecommunications. Especially if you are talking about cell phone service. Always looking to give back to others; this is the MLM motto for the companies and the entrepreneurs who work in them. I am finding network marketing and its people truly amazing. I have never seen such unselfishness in my life. And like I have said before, you would think with folks making this type of money, you would find the complete opposite. To help communities around the world, ACN has created Global Reach Charities. This organization works with such big names as the Ronald McDonald House. Additionally, ACN Project Feeding Kids work hard to combat childhood hunger. The best part is that everytime a independent business distributor (IBO) signs up a new customer, a portion of the money collected for the service goes to this charity. The ACN compensation plan works just as any other direct selling business. As an ACN agent, you earn a bonus for every customer you sign up. As long as your customers continue to receive their services through ACN, you will earn residual income. If your customer decides to become an IBO, you receive a bonus, plus bonuses for every customer your recruit is able to enroll. The possibility for financial growth is long-term and continuous. Debbie Davis has a belief about what it takes to do well in relationship marketing. While having faith is good, you must have a solid work ethic to go along with it. If you are not committed to put your all into making your home-based business a success, you need to move along. This means attending training (online, group, conference calling) even when you are tired and don’t feel like being bothered. I know, we all have days where we would just like to hide under the covers and hide from the world. But if you decide to get started in network marketing, you have to realize it is not just about YOU. It is really imperative that you understand this. In corporate America, you can get away with this. You can hide in your cubicle, your office, even the bathroom. “I’ll get to work tomorrow”, you think to yourself. But when you are in business for yourself, and in particular when you have a team you are leading, you have to set goals and meet them head on. MLM is a way to make money but it is a lot of hard work. The success rates are pretty low because of all the work that one would have to put into it. In all honesty, there is no get rich quick plan out there. If you have found one, then I would venture to say that it is a scam out to take your hard earned money and time. Make sure you do your due diligence on every ‘opportunity’ that you find. Look for real proof, from real people. Not just the ones at the top trying to sell you a bag of goods to get you sucked into something that has a low percentage of success rates! Whatever company or opportunity you decide to jump into, make sure that they can put their money where their mouth is, like you see here with some of my personal friends!